Elise Pellegrin (second right) poses with the Maltese Olympic Committee officials and her coach at the Rhosa Khutor Alpine Centre in Sochi, yesterday. Elise Pellegrin, the France-born girl who is representing Malta at the Winter Olympics, yesterday made her first appearance in the Sochi Games when she took part in the giant slalom race at the Rhosa Khutor Alpine Centre in the Caucasus mountains. Starting with the no.81, Pellegrin completed the first run in one minute 36.85 seconds to finish 72nd from 88 starters. In the second run, the 22-year-old of Maltese descent, managed to go marginally faster and recorded a time of 1:36.27 for an aggregate time of 3:13.12 that enabled her to climb up the rankings and finish 65th. In all, there were 67 skiers who completed both runs yesterday, the bottom place going to popular British violinist Vanessa-Mae. Vanessa-Mae, 35, was competing for Thai-land under her father’s name Vanakorn. Pellegrin finished ahead of China’s Lina Xia (3:15.62) while Vanessa-Mae clocked an aggregate time of 3:26.97. Slovenia’s Tina Maze took the gold medal with an overall time of 2:36.87... a mere 0.07 of a second faster than Austria’s Anna Fenninger. Viktoria Rebensburg, of Germany, was third in 2:37.14. 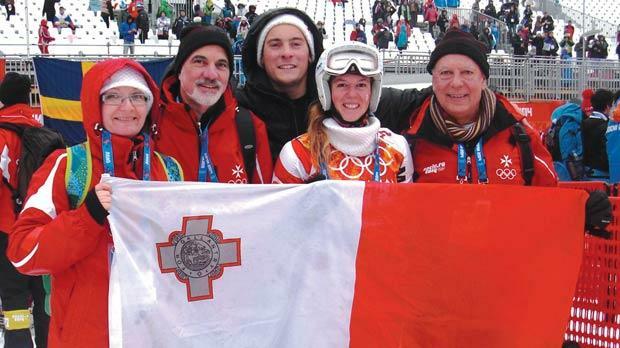 Pellegrin, the first athlete to represent Malta at the Winter Games, said the downhill was rendered more difficult due to the fog and heavy rain. “I am very happy that I managed to finish the race considering the fact that we competed in very difficult conditions,” Pellegrin said. “The weather made it harder as there was very poor visibility. Added to that it was raining, thus making the circuit rather tricky. “In fact, they told me that there were over 20 skiers, some of whom with high expectations here, who failed to make the finish line. Pellegrin is now focusing on her next event in Sochi, the women’s slalom on Friday where she expects a better result. “We have to shift focus to the slalom race now,” Pellegrin said. “This event is my preferred discipline. I’m sure I can finish with a much better result though I am keeping my fingers crossed that the weather conditions will improve in the next couple of days.